Shred Connect handles all of your corporate document destruction, personal paper shredding and offers secure shredding services. With our mobile shredding trucks, we come curbside to pick up paper for shredding or we welcome you to one of our drop off sites where you can leave your documents at your convenience. Shred Connect will give you a Destruction Certificate which certifies your information has been handled with extreme confidentiality. 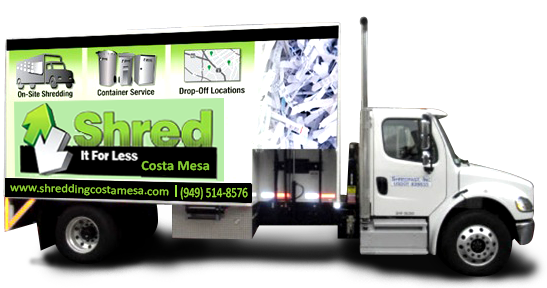 Call our Shred It For Less Costa Mesa,CA office at (949) 514-8576 to receive a quote for one-time or regular pick-ups or to have a secure storage container for your paper delivered to your door.